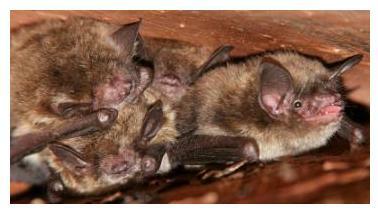 The Little Brown bat, widespread throughout all Ontario, including Southern .. I'm not sure why, but many people are afraid of bats, including the Little Brown Bat, but I have always had an affection for them. All bats are mammals and are therefore are warm-blooded and give birth to live young which they suckle. They are the only mammals which have the ability to fly, which they do using the flaps of skin which are between their "fingers". These membranes of skin are attached to their bodies, hind legs and tails, making them an efficient flying machine! When resting or sleeping, bats hang head-downward, by their feet, and they nest, or "roost" just about anywhere, in buildings, attics, under the eaves of a roof or under the loose bark of trees. During the winter time, these animals seem to migrate to a more southerly, and milder location, and or hibernate - often in caves or disused mines. This particular species, Myotis lucifugus, has an average weight of only 8 grammes and a wingspan of 22 cm. They are nocturnal animals and find their way in darkness by a system of "echolocation", whereby they emit a high-frequency sounds, which bounce back to them and give them an accurate "picture" of their surroundings. These sounds are ultra-sonic and are above the range of human hearing, and with this ability to echo locate, they also find their prey - flying insects, mosquitoes, moths and beetles. These creatures have an interesting life cycle - the parent bats mate in the late Fall, however, the actual fertilization is delayed and the females become pregnant after hibernation in the Spring. The young are born about 2 months after fertilization, between May and July, and the babies, or Pups, are raised in communal nursery "roosts". The mothers have only one baby each year and amazingly, when the mothers fly away each night to feed, they are able to find their own baby out of the hundreds waiting in the nursery! The babies grow quickly and are capable of flight at around 18 - 20 days old and are beginning to be weaned off mother's milk, onto a diet of insects. Bats are long-lived mammals, the current record for being a banded little brown bat from a mine in eastern Ontario that survived more than 35 years. As bats are mammals, they are also susceptible to Rabies, and therefore, should be handled with caution, in fact, don't handle them unless you have to.